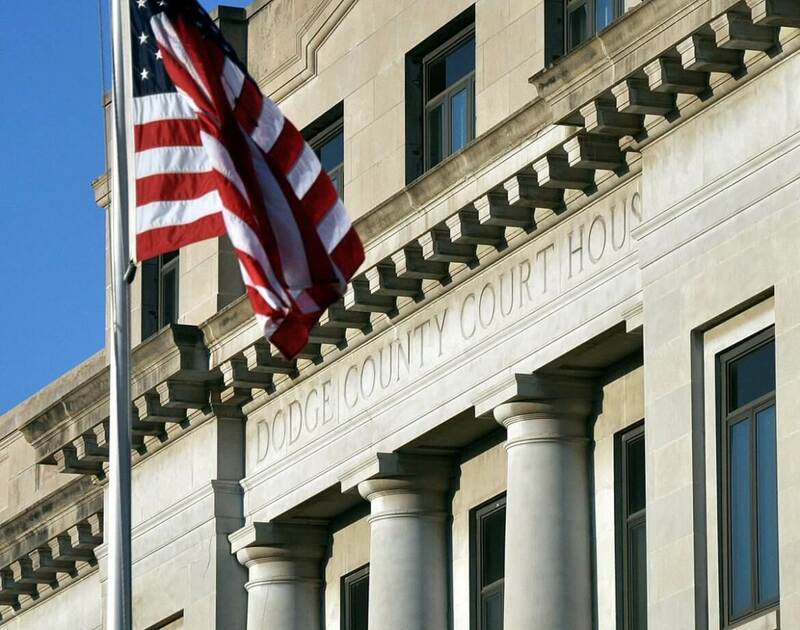 In 2018, the justice system in Nebraska’s Dodge County found itself navigating a new responsibility: rehabilitating individuals returning from the state prison system. “Probation now has all these people they have to deal with, either through presumption or post-release supervision,” said District Court Judge Geoffrey Hall. An individual may violate their probation or supervision by committing a new crime, but may also receive sanctions for things like missing classes, testing positive for drugs or alcohol, or missing scheduled drug tests. Punishments can include administrative sanctions, like additional classes, or custodial sanctions — short bursts of county jail time that rarely last more than a few weeks. A motion to revoke felony probation or post-release supervision can be filed in court if a probationer has amassed 90 days’ worth of custodial sanctions, committed a new crime, or absconded. Once a motion is filed, that will bring the individual back before the court and could place them in jail as their case progresses. Even those who were discharged successfully may have faced custodial sanctions at some point in their term. — there were 1,795 custodial sanctions issued statewide last year, up from 1,056 the year before. Patty Lyon, chief probation officer for District 6 office, the local arm of the state probation agency, is hopeful that the system will help offenders in the long run by giving them the tools to keep them from re-offending — ultimately improving community safety. Additionally, the state probation office notes that keeping people on probation has a significantly lower price tag than keeping them in prisons. Previously, the only system of post-incarceral supervision in Nebraska was parole. But parole violators were sent back to prison — not jail — and the supervision was less intense or rehabilitative than probation or post-release supervision. Chelsea Burk understands the feeling. The Lincoln native and mother of two is currently serving yearlong post-release supervision out of Lancaster County, after completing a prison sentence on a 2016 charge of possessing methamphetamine. She left prison in July — serving only nine months of her 18-month sentence after receiving good time — with a new lease on life: sober and with money saved up from a work-release program. But while she believes that the strict regimen is necessary to get through to offenders, she also notes that probationers may face a slew of challenges that require more flexibility from the system: a lack of reliable transportation to get to mandatory appointments on time, unexpected changes in probation officers, mental health issues and substance abuse relapses. Some probationers, she says, “can’t fathom” maintaining the demanding schedule that probation requires, and often leave prison without the supports necessary to help them. “People that go to prison, there’s an underlying factor to what happened, and a lot of times it’s mental health, and sometimes it’s the substance abuse that’s deteriorated mental health,” she said. The consequences of mass incarceration are often felt more acutely at the local level, where there are fewer resources and less space to accommodate growing volume, says Jasmine Heiss, the director of outreach and public affairs for Vera’s “In Our Backyards” project, which studies incarceration trends. Sentencing reforms have played a role in driving jail growth nationwide, Heiss said. That’s because probation, seen by lawmakers as an enticing alternative to incarceration in states with overcrowded facilities, often simply becomes a nebulous extension of the incarceral system. James Farrell, a staff writer for the Fremont Tribune, is a 2018 John Jay Rural Justice Reporting Fellow. This article was written as part of his fellowship project. The complete version can be accessed here.